« Baby Teething Tablets Are they Safe? Fact versus fiction versus homeopathic teething tablets. < < Click to enlarge. I believe that the blame for babies' supposed severe adverse reactions to Hyland's teething tablets and gels by the FDA is incorrect. There are many etiologies in the differential diagnosis that needed to be ruled out. Did the FDA consider the fact that babies are teething during the same time span that the CDC recommends an entire battery of immunizations between the age of birth to 15 months? I have posed other questions. Scroll past the “Birth to 15 Months” image to read them. 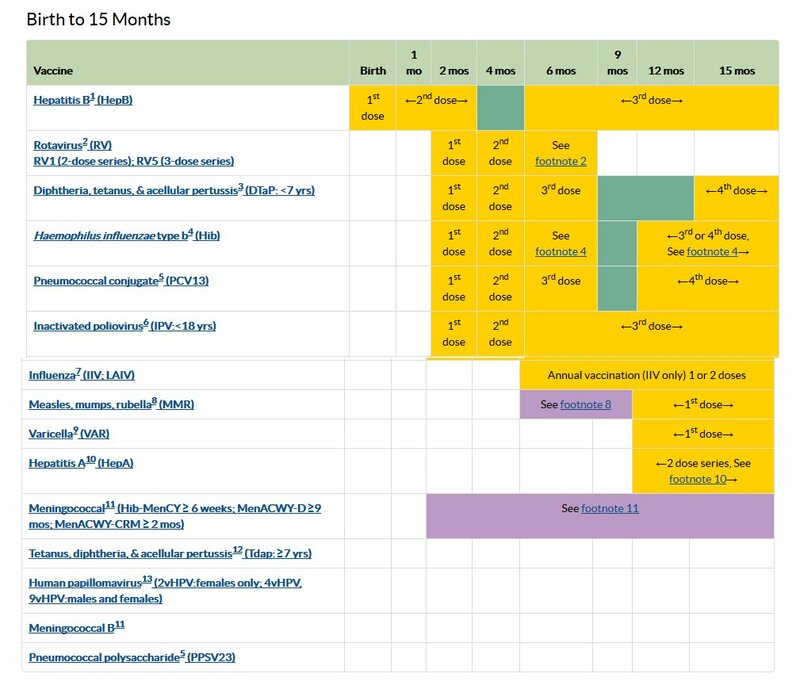 The CDC recommended accelerated immunization schedule birth to 15 months (screen shot below and link HERE) is quite an eye opener. Adverse effects to any medication do not occur in a vacuum. As a now retired health care professional and teacher involved in medical records reporting and documentation systems in both private and university medical teaching and training settings for 20+ years, I would suggest that Hyland’s at least know the answers to the questions I pose below the image of the immunization schedule of the CDC. First, however, I need to THANK and include a link to the reaction to the FDA warning about teething tablets by this mother of five! 1. Were any members of Hyland’s medical staff able to review all of the parents’ complaints to the FDA? If not, why not? 2. Have the complaints included proper documentation including the birth parents’ medical records to include established prior and current diagnoses, prescription drug and/or recreational drug use; was the mothers’ prenatal care without complications; what was the child’s date of birth; was the child carried to term or were there any detected pre-birth complications; were the attending physician’s delivery notes included; was the child delivered by C-section; were all of the transcribed office notes from each of the child’s in office examinations as well as current diagnoses and possible prescription drug treatments included; were the dates and types of the child’s immunizations for a period of no less than 18 months provided? 3. When did the child first experience symptoms that the reporting parent felt were due to the Hyland’s product? Was there a single episode or several? Was the child examined by emergency personnel, the child’s pediatrician or internist during or shortly after the reported event? 4. In the 24 hours leading up to the reported adverse reaction, was the child exposed to any commonly known environmental allergens including cigarette smoke, paint fumes, scented room fresheners, in home use of aerosol insect sprays, a change in laundry detergents or fabric softeners? Additionally, was the child exposed to a new pet (dog, cat, bird, rabbit, etc) in the home? 5. In the 24 hours prior to the reported adverse reaction, did the child have a change in diet or formula? 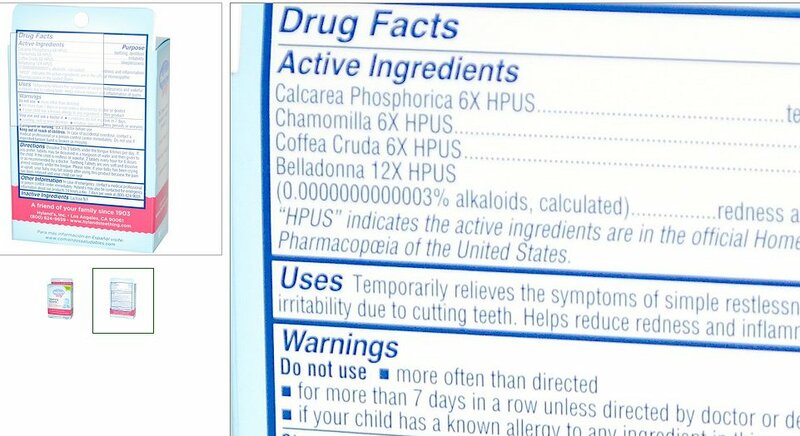 FDA Claims Level of Belladonna 0.0000000000003% (less than 1 mg) in Hyland’s Baby Teething Tablets is Unsafe.